Slow to get started, this episode becomes more action packed but also far less interesting at its' halfway point. What starts out as a unique look at an alien culture devolves into a series of cliches. Despite this, the action is engaging and Matt Smith continues to impress in his slightly darker Doctor persona while Jenna-Louise Coleman's Clara gets some much needed definition. Good but not great. After taking several quick trips to the past to examine how Clara Oswald's parents met, fell in love, had her and raised her, The Doctor is more confused than ever about The Impossible Girl. Despite everything, Clara seems to have had a perfectly normal childhood apart from her mother dying at a young age. 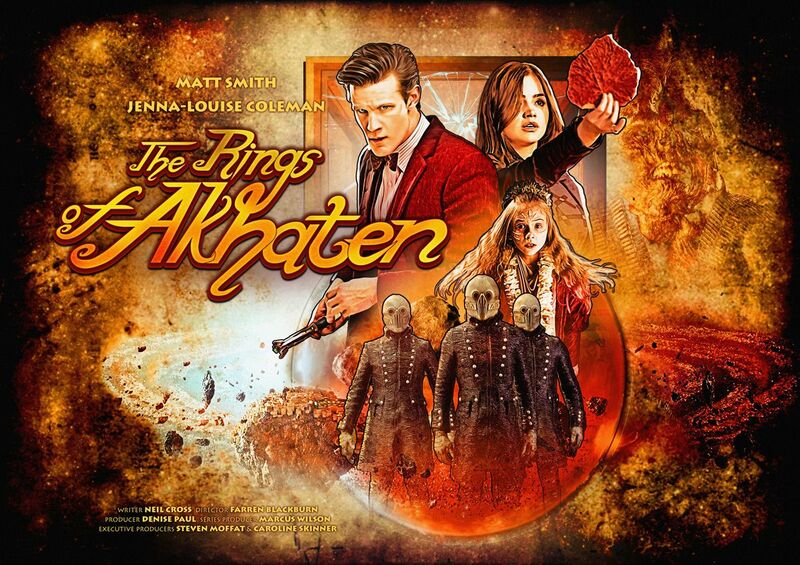 He's on somewhat firmer ground when he returns to take Clara on a trip to see "something awesome" and delivers her to see the inhabited rings of Akhaten and the golden pyramid where some say all life in the universe originated. * Lots of nods to the classic series, with The Doctor assuming a Venusian Karate stance after being startled while spying on Clara's parents. He also refers to having visited Akhaten before with his granddaughter. The Doctor's speech as he confronts The Old God may be a reference to The Cartmel Masterplan or at least the idea that The Doctor is thousands of years old, as The Third Doctor once said. * Matt Smith's Doctor seems to have changed - for the better, by my reckoning. Snatches of the silly man-child are still there but we're seeing far more of the old Time Lord. Forget the new pair of brainy specs - I never would have imagined the Eleventh Doctor shushing someone during a church service before this episode, much less found it believable! * Looking back, I think the most successful Doctor Who companions were given a chance to show their capability and personality without The Doctor's presence. Sarah Jane Smith had her moment in The Time Warrior where she proved perfectly capable of surviving in medieval times without The Doctor's aid. Leela was cast out by her people and shown surviving in the wild for a time before she ever met The Doctor in The Face of Evil. Rose Tyler spent most of The End Of The World wandering around a space-station and just talking to people, showcasing her natural empathy and dislike of elitists. I mention this because Clara is finally given a moment like this in this episode, as she helps The Queen of Years escape from the people that are hunting for her and tries to cheer this little girl up with a story of when she was young and scared. It's a magical moment and it tells us far more about Clara than anything we've seen yet in the show. * It's rare for Doctor Who to examine religion and rarer still for it to be done in a positive light. Whenever an alien religion has been depicted, it's usually been run by a corrupt priesthood trying to crush all resistance to their power and most of the followers portrayed as easily-duped fools who stood in the way of The Doctor's helping them with the power of reason and science. The first half of this episode breaks away from that trope, with The Doctor - usually snide about archeologists and other people who try to determine the past by examining old relics and legends - referring to the Akhaten's view on how life in the universe was created as "a nice story". He also appears genuinely enraptured by the ceremony at the Festival of Offerings... at least up until things go wrong. * ... and when things start to go wrong at the festival, that's when this episode becomes like every other story we've seen before where The Doctor confronts a false god and destroys it. A real shame considering the episode opens up with the promise to be something different. It starts out as something unique and original and ends up much the same as many other episodes. Still, half a unique episode is better than none and the performances continue to be quite excellent. Fans of the Third and Fourth Doctors will probably enjoy this episode, as there's a lot of nods to The Third Doctor's tenure and the story reads like something Robert Holmes would have written at the height of his Gothic Horror phase.